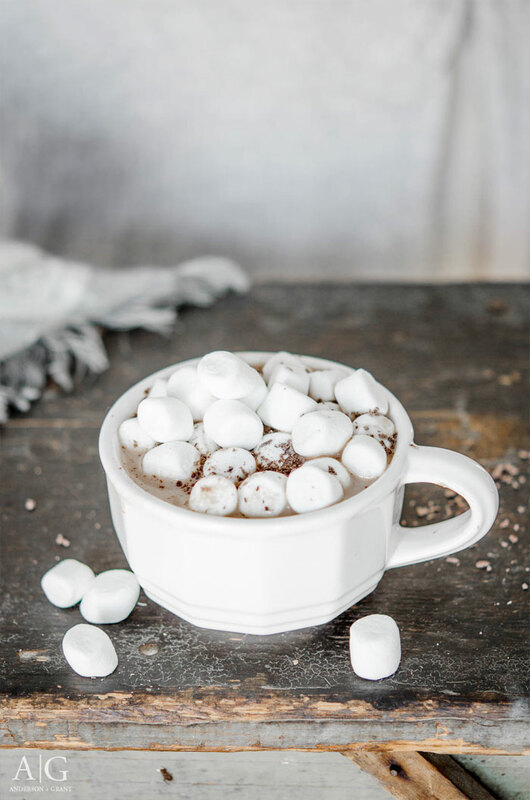 Hot chocolate is a must have beverage in the cold winter months. Learn how to make your own homemade mix to add to warm milk and also how to give it a peanut butter twist. Although it took quite awhile to get here, the winter chill appears to be hitting central PA. I was perfectly content with continuing to wear my fall jacket and lightweight sweaters, but the twenties seem to be sticking around now for now. Through these cold months there is one thing that is never too far out of my reach....a steaming mug of hot chocolate. Every sip on a snowy day takes me back to childhood with memories of building snowmen and digging tunnels through the snow while my dad cleared the driveway. 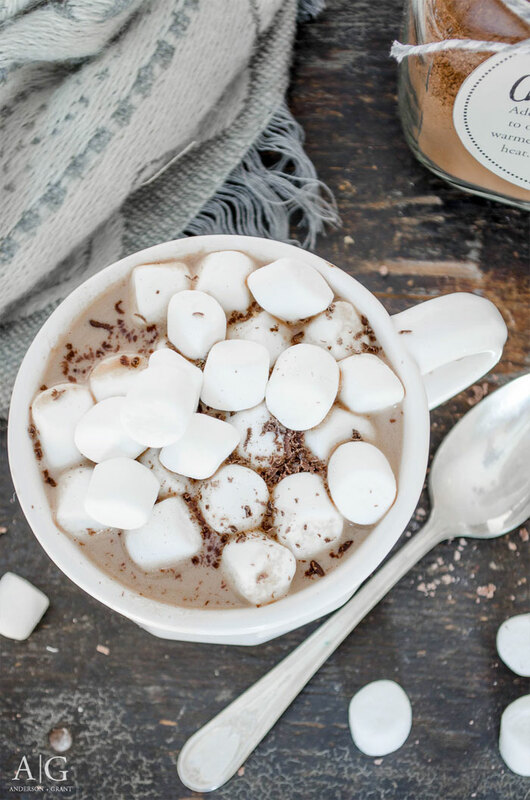 Not being too much of a fan of the cold, those activities never lasted long before I was ready to go inside and get warmed up with cup of hot cocoa. 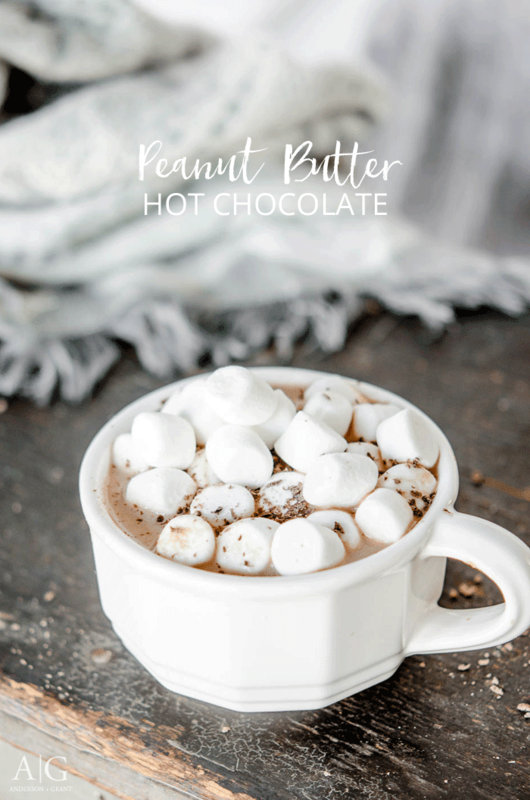 A few years ago, I picked up a can of peanut butter hot chocolate mix from Target and became a little addicted. And then, as is normally the case when you find something to love, the store quit selling it. This year I was determined to find a way to make my own version of the hot beverage to satisfy my craving. There are many recipes out there for homemade cocoa mix involving heavy cream and I'm sure they are delicious. But I was searching for something I could store all winter long in my cupboard and pull out when the desire hits. Something just like a box of hot chocolate packets you could pick up at the store, but without all the added unnatural ingredients. Plus, heavy cream is not something that normally resides in my refrigerator. 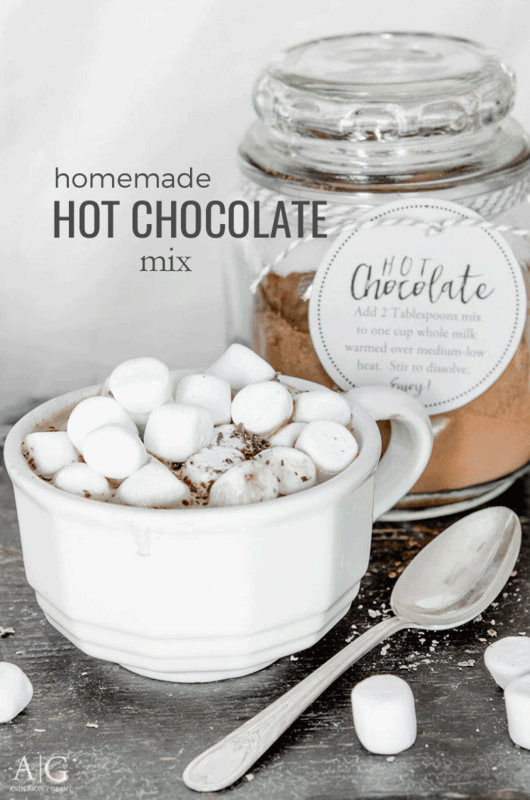 This recipe for Homemade Hot Chocolate Mix is a combination of a couple different Martha Stewart versions that create the perfect hot chocolate for these cold winter days. It is easy to prepare and takes just a few ingredients, all of which you probably have on hand. And thanks to Martha, I found the secret to adding that peanut butter twist to the chocolate drink that I think you'll really love as well. This recipe can be doubled or tripled depending on how much you believe you'll use through the season. It will last all winter long if stored in an airtight container. 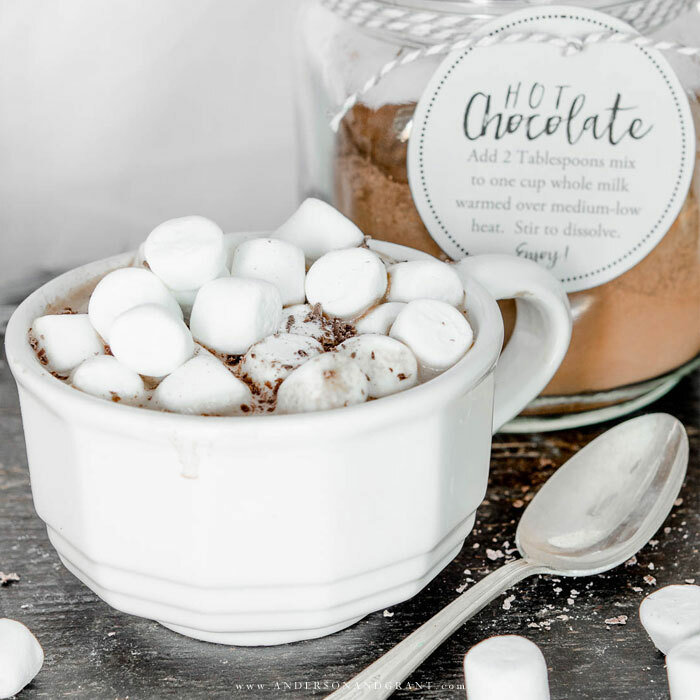 The flavor of your hot chocolate depends on the flavor of the cocoa powder that you use. Use a good quality cocoa powder for the most flavorful results. The same theory applies to the peanut butter if you're adding in the flavor twist. You may want to add more or less sugar depending on the taste you prefer. Make a small batch, test it out, and then note whether or not you think it needs a different amount added the next time. The mix that I made is being stored in a glass canister from Goodwill. I tied a tag with baker's twine to the outside so that I don't have to refer back to the recipe every time I want to make hot chocolate. There is a second tag underneath the first with the instructions for the Peanut Butter Hot Chocolate. If you'd like to do the same, I've put together a free printable tag that you can make yourself. Print it out on cardstock so that it is durable. Alright.....are we ready begin mixing up our cold weather treat? Combine the sugar, cocoa, and salt with a whisk (or sifter). Be sure to eliminate all of the lumps of cocoa powder. Store this mixture in an airtight container. 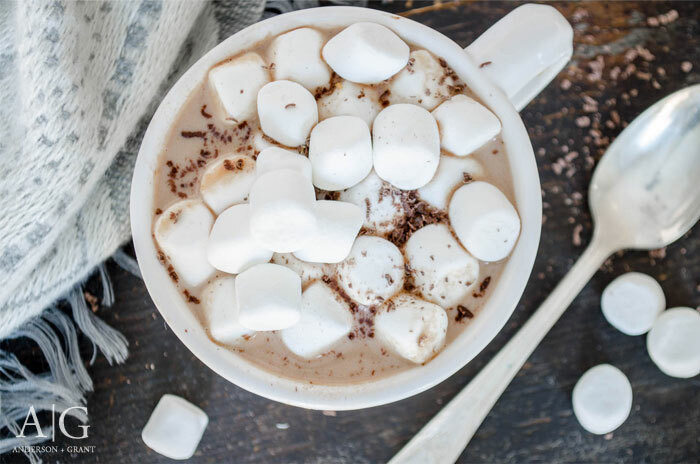 When you are ready to enjoy a cup of hot chocolate, heat one cup of whole milk just until hot over medium-low heat. Be sure not to let the milk boil. Add 2 Tablespoons of the cocoa mix to the milk and stir to dissolve. Then whisk in 4 teaspoons of peanut butter if desired and stir until the beverage is smooth. 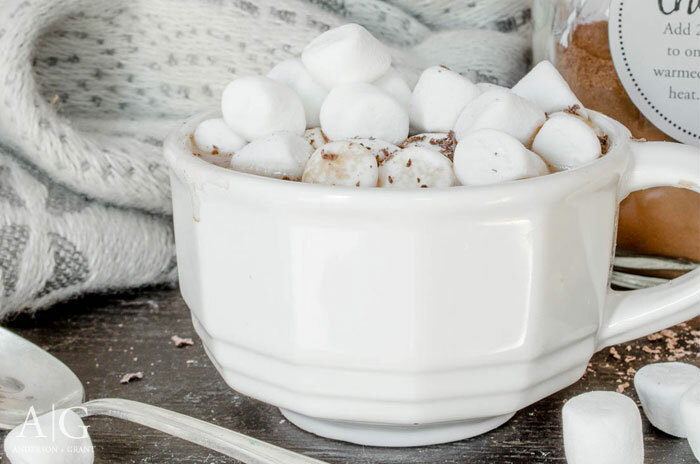 Pour your hot chocolate into a mug and top with some whipped cream, mini marshmallows and shavings of chocolate for a perfectly indulgent cold weather drink! Creamy Chicken Noodle Soup - Made in a crockpot! So what do you think friends? Will you be whipping up a mug of this later today?